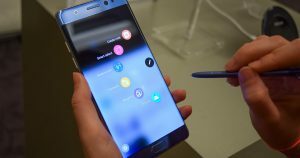 The Samsung Galaxy Note 7 cell phone has been officially banned on all United States domestic flights. The order was recently handed down by the U.S. Department of Transportation. The phones may also not be shipped as cargo and this emergency order went into affect on Saturday, October 15. If you attempt to fly with a Note 7, it will be confiscated. Other airlines, like AirAsia, are quickly following suit. The phones have become a serious problem of late as many of them have exploded and/or caught on fire causing injuries and damage to the phones. You can’t travel on the plane with one and if one is found during an inspection of your luggage, the DOT states that you could be criminally prosecuted for it. If an airline staff member sees you with a Note 7 prior to boarding, it will be taken away from you and all of your luggage will be thoroughly searched.